Players seeking to enjoy a safe, legal and high-quality Philippine bitcoin casino experience will find enlightening information in this guide about how to use cryptocurrency as a Philippine online casino deposit method and available Philippine online casinos that accept or intend to accept bitcoin. Here we explain the legality of bitcoin, its function as a digital currency, and show Filipino players the best bitcoin casinos to visit. Bitcoin gambling sites are often associated with a lot of confusion - how do they function, how do I deposit bitcoins on a bitcoin gaming site, etc. which is why we crafted this informative guide about Philippine legal online casinos accepting bitcoin. Yes, the Bangko Sentral ag Pilipinas’ released Circular No. 944 which allowed for the BSP to direct formal regulations on virtual currency and their exchanges. This circular is the BSP’s attempt to level the regulatory playing field for cryptocurrencies. However, the BSP has made various public statements that they do not endorse cryptocurrencies such as Bitcoin due to their lack of central bank or government backing. Nonetheless, due to the BSP requiring that BTC exchange services must be registered allows for direct oversight and tight reigns, yet without these guidelines bitcoin could not be legally used and exchanged in the Philippines or for online gambling at Philippines online casinos accepting bitcoin deposits. To further add, the legality of bitcoin does not affect current Philippine gambling laws. Several countries have released formal regulations on digital cryptocurrencies whether positive or negative, these countries so far were Japan, China, South Korea, United States and Australia. These are the most reputable online casinos that accept both Bitcoin and players living in the Philippines. In addition, each of these sites also offers all kinds of betting under one account including sports betting, poker and casino games. Bitcoin is the original cryptocurrency and often called the king of crypto. Bitcoin was the first decentralized digital peer-to-peer payment system and founder of blockchain technology. Bitcoin is extremely popular in the Philippine’s due to the country ranking as #3 in top users of this cryptocoin around the world. Bitcoin may seem intimidating but in reality, it is just as easy and simple to use as fiat money except with Bitcoin the currency is not physical due to its digital nature and remains in a user’s e-wallet until directed to be sent to another person. The use of digital currencies like bitcoin allow users to gain instant access to global online marketplaces and even Philippine bitcoin casinos to initiate transactions and receive immediate payments directly to their e-wallets. This allows for the elimination of 3rd party merchants and facilitate more peer to peer interactions. Bitcoin’s value is directly influenced by its use, which means the more people are using the coin the more value it gains. The first thing Filipino players must do, is to obtain a digital wallet also referred to as an e-wallet. In order to store, receive, or send bitcoins players must build and register an e-wallet through a specially designed app or website. Creating a wallet is not difficult but requires a lot of security to ensure that only the player is able to access the e-wallet and its contents. Everyone participating in the transfer of bitcoins must obtain their own e-wallets to exchange and store bitcoins for future purchases or investment purposes. Once players build their wallets, sending and receiving bitcoin becomes an easy process that allows for cheaper transactions and faster deposits. Bitcoin wallets also allow for the ease of facilitating access to Filipino bitcoin casinos. Are Bitcoin Casinos Legal in the Philippines? To specifically address the legality of bitcoin casinos accepting Filipino players, we must understand that there are no laws within the Philippines that restrict or directly mention bitcoin powered online gambling. Bitcoin’s anonymity offers a cloak of ease to players concerned over the legalities of gambling online; however, Philippine laws have no jurisdiction nor prohibitions against its residents participating at offshore online gambling sites. For that reason, if legality is a large concern for you, gambling on a Philippine bitcoin casino remains completely legal and worry-free so long as the online casino is licensed by a legitimate jurisdiction found outside of the Philippines. The same accounts for Dash casinos, online casinos accepting Ethereum, and Litecoin casinos for Filipinos. Decentralized cryptocurrencies allow for a buffer between bitcoin gaming sites and players through anonymity. This allows Filipino bitcoin gambling to flourish and remain secure gaming platforms. In order for online game hosts to serve Filipino players, gaming sites must contain bitcoin cashier capabilities in order to receive BTC deposits from players. 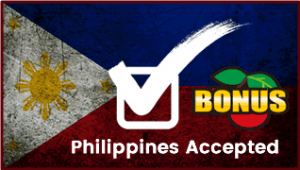 This enables all Filipino players access to legally licensed offshore online casinos and their offered games. The process for initiating online casino deposits with bitcoin is rather easy, users simply enter the amount they would like to deposit at the online casino and then follow the instructions and prompts for sending the coin with their e-wallet. After sending the bitcoins from said user’s e-wallet to their personal casino account, players receive the funds into their account within minutes, if not seconds. Due to lower transaction and processing fees, BTC payment methods tend to offer a wider range of deposit and withdrawal sizes. With cryptocurrency deposits, players do not need to wait weeks to receive their payout, endure credit card decline issues, or experience a waiting period before playing games. Bitcoins are comprised of small bits of data and can be broken down from a single bitcoin into bits. BTC can be obtained through purchases, mining, conversions, and transfers. The more bitcoin is circulated and actively used, the more its value increases, which means the value of one BTC can potentially inflate. Bitcoin funds are secure and only transfer from user wallets to other user wallets and utilize private keys or seeds to retain their security over personal crypto funds. Bitcoins are maintained through blockchain technology and run on large mining servers and computer networks which communicate with one another. Provably Fair is a special algorithm created to read the blockchain ledger and records to confirm absolute fairness in online crypto games and Philippine bitcoin casinos to build trust for BTC run casinos and games. This verification process requires the game to enable itself as an open source for multiple cross examinations for coding errors and probability manipulation. At the moment, BTC is growing in popularity and the need for a transparent system could never be more prevalent. In order to end the stigma around unfair online games, Provably Fair comes to deliver absolute transparency for every cryptocurrency run game. While bitcoin runs on a decentralized platform it does employ a variety of safety protocols and cryptography to ensure an impenetrable system. Bitcoin has been hacked in the past and its external counterparts seized and discovered for fraudulent activities. However, the developers behind BC have implemented necessary safeguards to greatly improve its functionality while also creating methods for blocking and identifying potential threats. What Are the Benefits to Using Bitcoin At Online Casinos? Bitcoin usage allows for secure transactions and currency transfers while also permitting true payment freedom were user’s may spend or transfer bitcoins at their leisure without regulatory oversight from central banks and government agencies. Bitcoin users are capable to verify the transparency of their cryptocurrency, cryptomarkets, and cryptogames. Bitcoin’s transparency is helpful in verifying whether online casino games were manipulated by players or casino hosts themselves. Not only that, the convenience bitcoin offers as a digital currency has allowed it to flourish in the Philippines. What Are the Disadvantages To Having Bitcoin? Retaining bitcoin in their digital state within e-wallets run the risk of their value being influenced by price fluctuations. The coin is relatively volatile and the value of it entirely dependent on its use and current and potential development. BTCs also have a finite limitation to their existence of which the coin is currently nearing. Outside of these two issues remains one major disadvantage, the lack of awareness. Bitcoin is as much a brand as anything else and even it suffers from lack of brand awareness; while it may have mastered brand recognition, awareness is crucial to increasing its value through continued use. With newer cryptocoins entering the market it, we may see a discontinued use for bitcoin in the future unless BTC is able to break from these disadvantages. Can I Use Bitcoin With Any Other Forms Of Online Gambling? Absolutely. You will find that bitcoin is accepted at multiple Philippine legal online poker sites as well as Philippine legal online sportsbooks and horse betting sites.